Friday, March 8, ToyLanta 2019 kicks off. This is the annual huge, gigantic, epic toy show that is also a fundraiser for The Cody Lane Toy & Diorama Museum. This will be your PopCulteer’s seventh trip to the big show, and all week long we’re going to offer you special previews of what you can expect at the show. 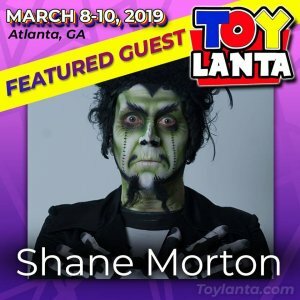 ToyLanta will run March 8 through 10 at The Marriott Century Center in Atlanta, Georgia. The show is open to the public on Saturday and Sunday, March 9 and 10, and attendees who purchase the Commander and Cadet packages get in to all sorts of cool pre-show and after-hours events. Today we’re going to look at three of the special guests, Larry Hama, Larry Selman and Shane Morton. Larry Hama is a writer, cartoonist, illustrator, actor, and musician who has worked in comics, tv & film. He’s best known as the writer of Marvel’s GI Joe and Wolverine comics. Most recently, he’s the author of The Death of Captain America a prose novel for Marvel that features characters (Winter Soldier, Black Widow, Nick Fury) who are prominent in the new Captain America movie. Larry is currently continuing the adventures of GI Joe for IDW Publishing, and his co-creation, Bucky O’Hare, has recently returned to the world of toys after nearly a thirty-year hiatus. Personally, I’ve bee a fan of Larry’s since his days working for The National Lampoon inking the comic strip, One Year Affair. It’s been a wild ride, watching as he jumped to Atlas Comics to create Wulf The Barbarian before a stint as an editor at DC Comics, and then his long career at Marvel Comics, editing, writing and drawing. It’s been great to get to meet him at JoeLanta/ToyLanta, and talk about his other endeavors in film, music and theater, as well as comics. 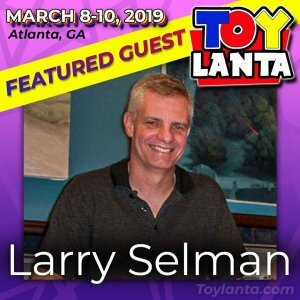 Larry Selman was born in Pennsylvania and raised in a military family. Following graduation from York Academy of Art in 1982, he built a successful career in the paperback novel illustration field. Collaborating with the top art directors and major publishers in New York and around the United States such as Bantam, Dell, Avon, Outdoor Life, New American Library, St. Martins and many more while establishing a reputation of excellence. As an illustrator his work appeared on many of the Classic Collection of GI Joe- over 125 pieces of box art in an 8 year span. Several ofthe illustrations received prestigious awards from the packaging industry. Leaving the illustration field he has been firmly established in the American historical art market for several years. Original works of art can be found at the US Army War College, Command and General Staff College Ft. Leavenworth and on bases and museums throughout the United States. He is the only artist to depict every era of American military history and every branch of service. Larry has also contributed to the Jurassic Park franchise with some amazing packaging and promotional artwork. In over two decades as a professional in the horror business Shane Morton has worked with such greats as Stan Winston studios and Rob Zombie. He has designed and built horror attractions and haunted houses all over the country, the Atlanta Zombie Apocalypse, being his biggest and best. You can see his recent film work in the indie, grindhouse hit, Frankenstein Created Bikers, in Sam and Mattie Make a Zombie Movie, and on television with Adult Swim’s smash hit, Your Pretty Face Is Going To Hell, where he was the Art Director of Hell and supplied special effects and make-up before becoming a producer of the show with its second season. He continues to make music videos with Mastodon, his latest being Asleep in the Deep. He is the producer, writer, director, and lead actor of The Silver Scream Spook Show, which has been running for over 6 years now with 50 episodes and over 100 performances. The guests are only part of the attractions at ToyLanta. The show kicks off Friday for early attendees, and opens to the general public Saturday.